Afterour successful March trip, the following weeks of fishing were filled with frustration in the form of high winds and thick sargassum weed. 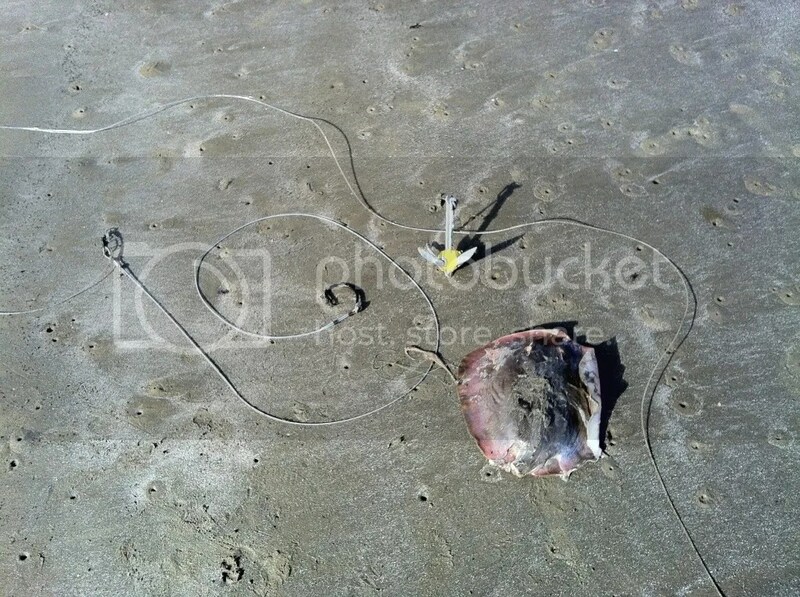 You can’t fish when there is a lot of sea weed because the weed will wipe out your fishing lines. After a team meeting, the unanimous feeling was that we needed to get more sharks on the beach and it needed to be soon. 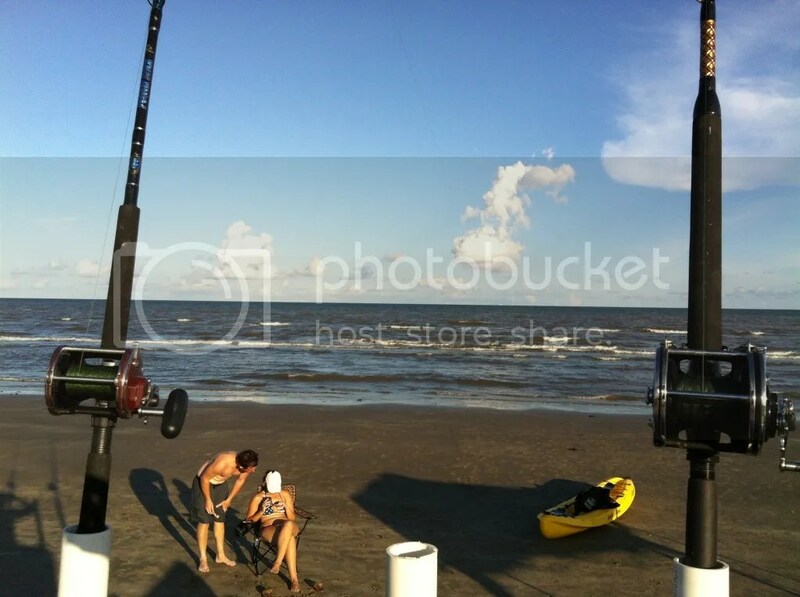 Fellow Lost Boy Justin Foye, my wife, and I decided to head down to Surfside Beach, Texas Monday afternoon after we read reports of flat surf and minimal weed. I checked the tides and we were going to have a strong outbound all afternoon. We arrived on the island at 2:00 pm and were immediately welcomed to flat conditions and breathtaking green water that was well within reach. I had successfully landed a few stingrays back in June and we had three left, so all we needed was a few pounds of dead shrimp to catch some fresh bait and we were all set to go. We finally parked at what looked like a promising spot on the beach and unpacked. As I set up the rack, rods, and leaders, Justin took to the surf wielding our trusty Sabiki rigs to catch some fresh bait. Justin immediately landed a few small whiting but we released them in hopes of landing a larger bull whiting. We pushed forward and ran my Penn Senator 9/0 out baited with a whole ray close to 400 yds. off of the beach into the pristine green water. By this time the seagulls and pelicans really got active and were bombing the water all over our general area. We picked a great spot on the beach and the water was beautiful! Getting all the baits kayaked out and the rods in the rod rack! Justin and I both went back to catching bait and still were only managing 6-10 inch whiting, so we returned to the truck and baited my Penn Special Senator 4/0 with another ray. 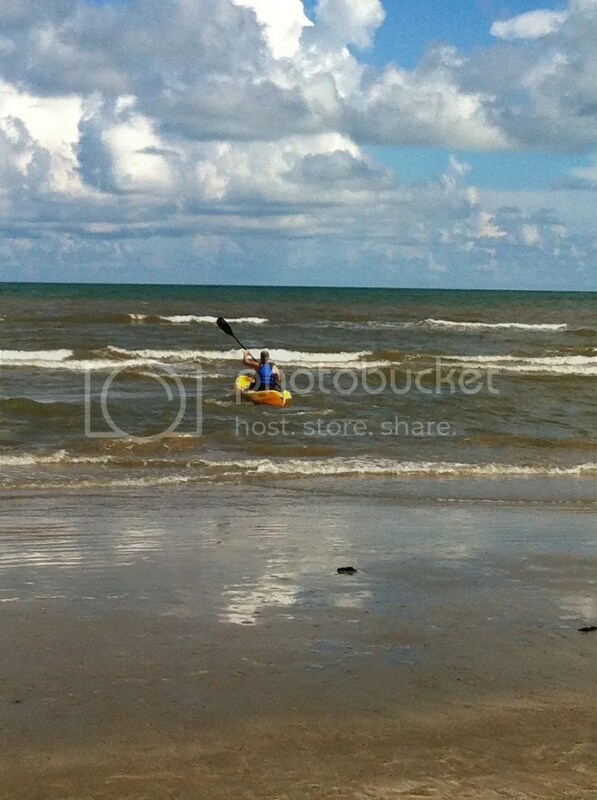 At 4:00 P.M. we got ready to run the ray out with the kayak, and my 9/0 started screaming! We ran to the rod and let the shark eat for a few more seconds. I tightened the drag down and harnessed up. The shark quit fighting and I could feel no action coming from the other end of the line. 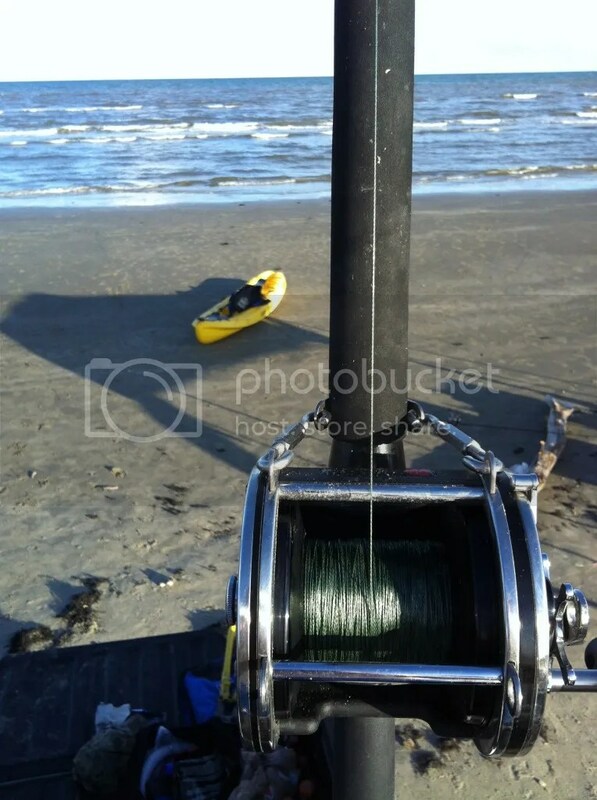 The weight still seemed snug in the sand so I put the rod beck in the rack and we waited. Not 30 seconds goes by and it starts screaming again! This time I harnessed up tightened down and reeled it all the way in. Still with no action coming from the end of the line, we were all skeptical at what was going to show itself, if anything. As the top of the leader exited the water I began to feel some very strong headshakes and then that beautiful dorsal fin erupted from the calm water in the second gut! 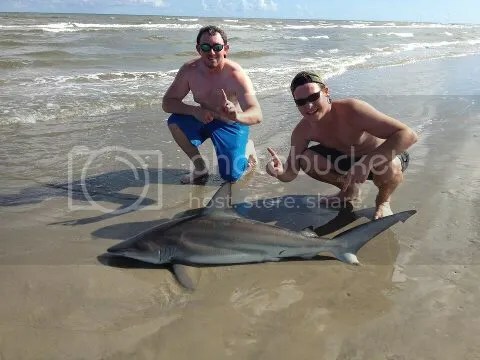 With leader in hand, our first shark hit the beach. A gorgeous 58 inch black tip hit the sand and this trip was already a great success! After a few quick pictures we waded her out and she swam of very strong. 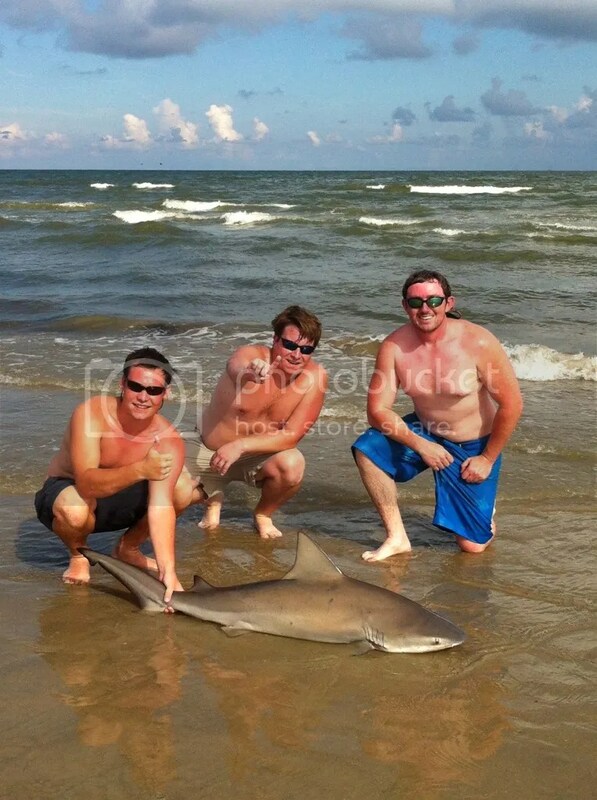 We couldn’t believe after only thirty minutes with a line out, we already had one shark landed and released. We baited the 9/0 with the final ray and ran it back out roughly 400 yds. We finally got the 4/0 with the half ray that we baited earlier ran out to roughly 300 yds. Justin and I went back to looking for that perfect whiting and finally we caught it! A good 14 inch bull whiting and in no time he was rigged up and out into the green water about 250 yds. At about 6:00, Justin returned from paddling baits out and the 9/0 took off again. We harnessed up my wife and the shark was on. She did a wonderful job using that heavy set up, and especially since it was her first shark and her first time using a non-level wind reel. We definitely baptized her by fire ha-ha! This fight was just like the previous, but did have some good head shakes all the way until the leader surfaced. 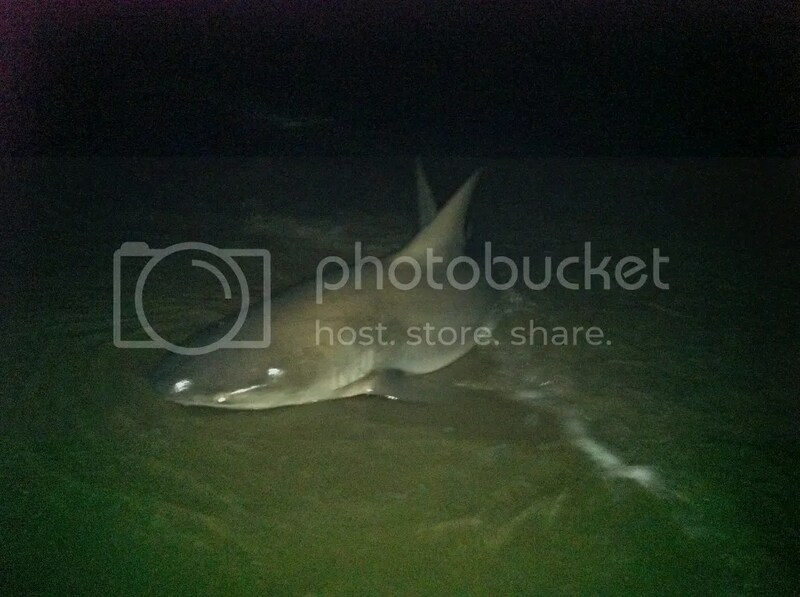 A few more good head shakes and my wife had her first shark on the beach. Another beautiful black tip and this one taped out at 48 inches which was her first shark and her new personal best. 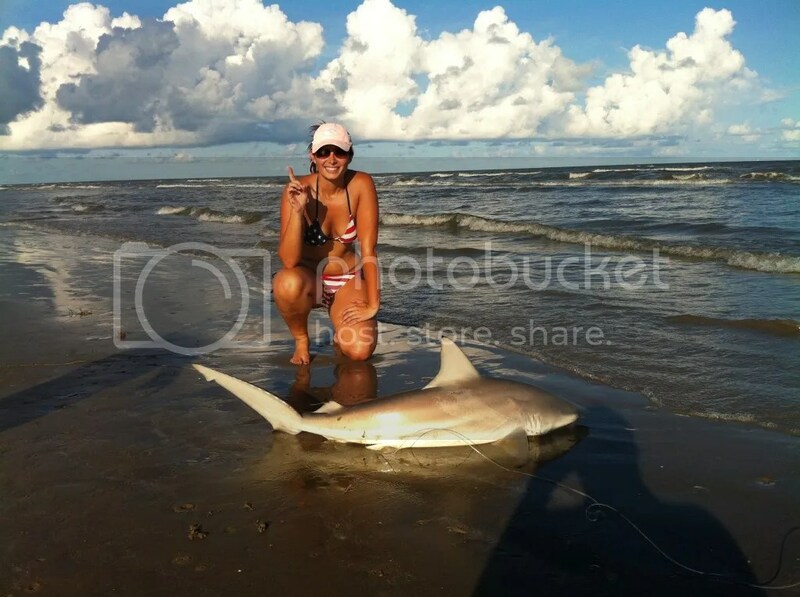 Catherine’s biggest shark to date! A nice fat Black Tip! 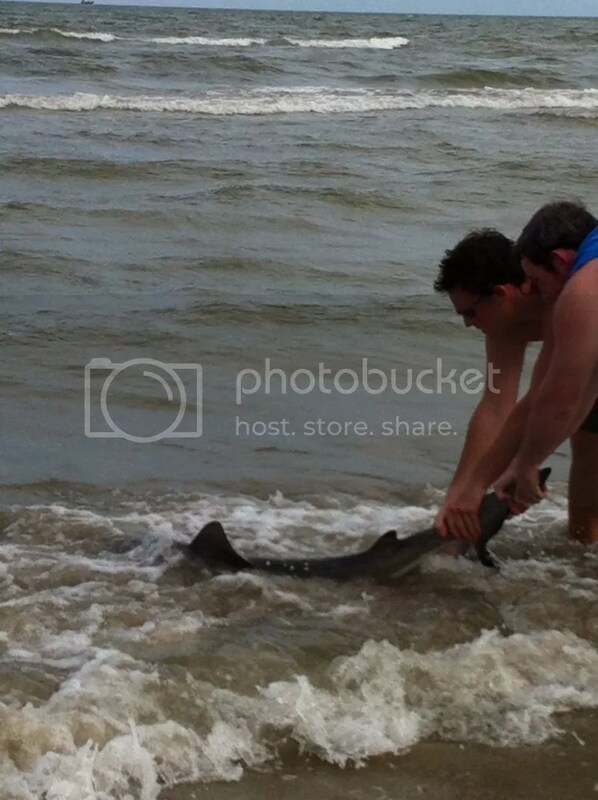 We snapped a few quick pictures and released her and once again the shark swam off very strong. 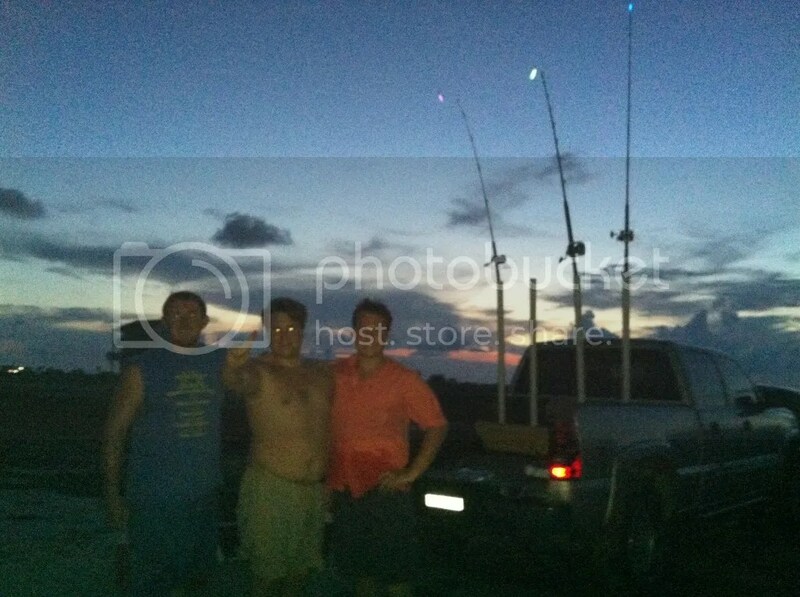 With night approaching quickly, we hurried to get the final half of ray baited up and kayaked out. We finally had all the lines out and could just relax. The mosquitoes began to swarm and we had neglected to bring any OFF, so we retreated to the truck and watch the glow sticks that we had attached to the lines for any sign of line coming off the reels. Around 9:50 pm we decided to give it another thirty minutes before we called it quits. At 10:10 the smallest setup we had which was an Okuma level wind began to slow roll. As we exited the cab with our adrenaline starting to pump, the line started screaming off the reel. We quickly removed it from the rack locked down the drag and fish on! This shark was mad and wanted us to know it! He drug us up and down the beach and nearly into the water! After gaining line and having it ripped off for over an hour, we finally reached the leader. 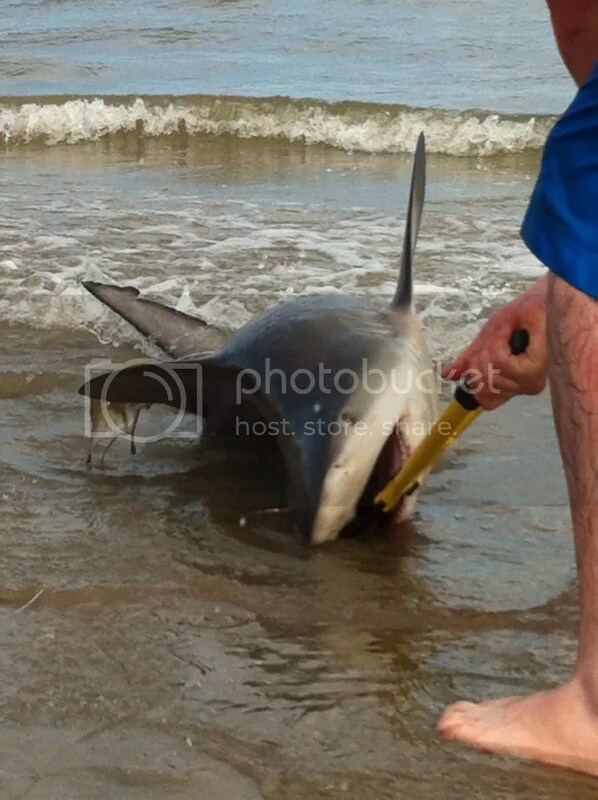 The shark was exhausted as we drug its massive body onto the beach. It was a very thick Bull that taped out at 72 inches! 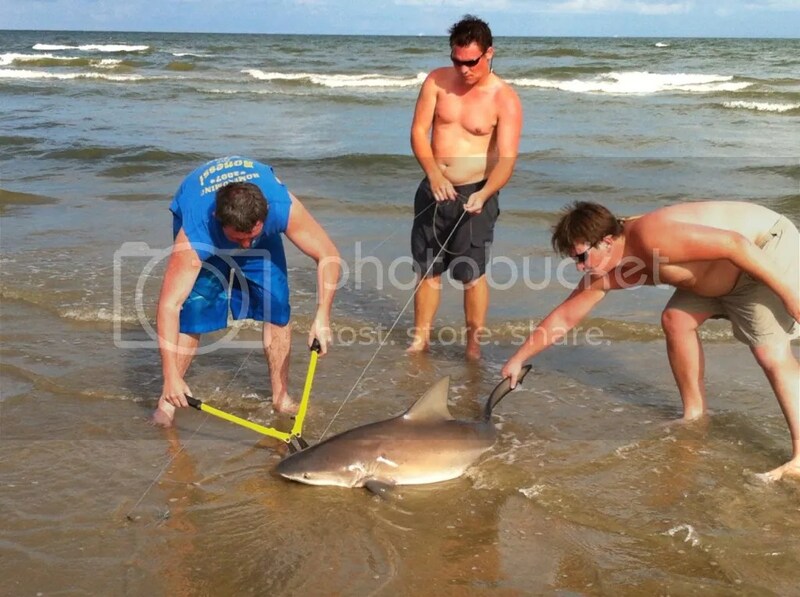 The excitement was overwhelming but we needed to get this shark revived quickly and back on its way. 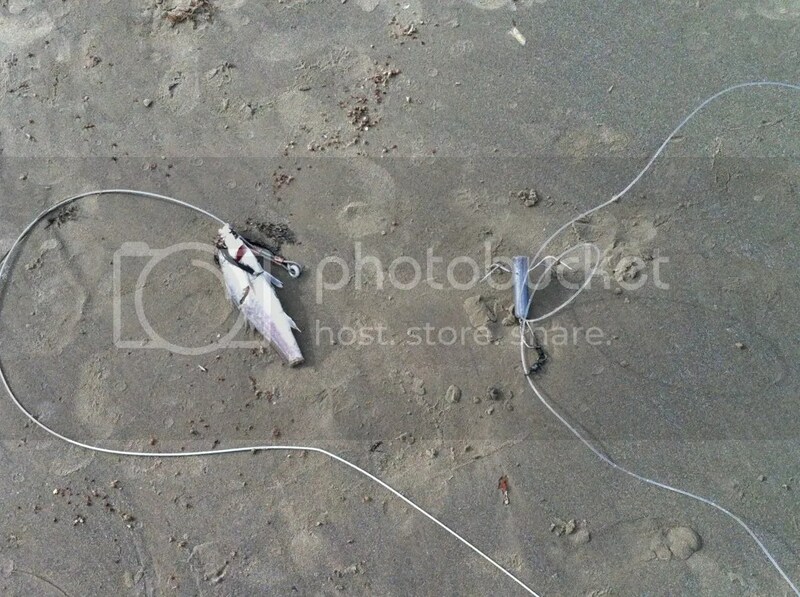 We snapped a couple pictures and began to revive the shark. Fifteen minutes later the shark began to kick strong and swam off. 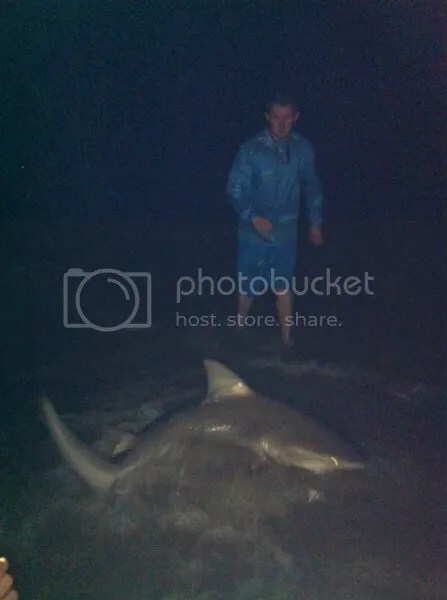 Josh with his 6 foot fat bull shark! Justin with the big beautiful bull! The bull was finally landed after a nearly 40 minute battle! The day and night were such a huge success we turned our one day trip into a two day and decided to stay the night at a hotel. Day two started with a bang as we were greeted by even calmer conditions and green water to the beach. We stopped by Bayou Bait and Tackle to grab some more rays and a few more pounds of shrimp. Luckily, the rays had just been brought off the boat and were extremely fresh. We hit the beach at around 1:00 PM and found our spot from the day before and began to unpack. Justin hit the surf again for fresh bait and returned with a few decent whiting. We rigged them up on the small Okuma and ran it out for a short drop of 200 yds. Once again as we started to rig up the next line, it started screaming. We let it eat, locked down the drag but nothing was there. We set it back in the rack and went back to rigging the 4/0 and 9/0 with rays. 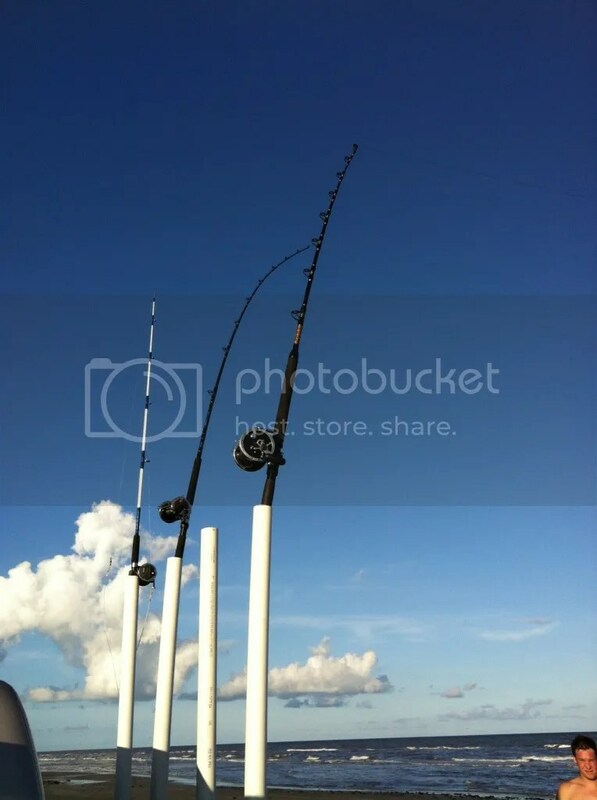 After running out both of the other rods, we had all rods out and began to wait. Another fellow Lost Boy Craig Emmite showed up for the afternoon and evening bite, and not long after the action started again! The Okuma started screaming once again and this time we let it eat good. Justin locked down the drag and fish on! After a few good head shakes the line went light and we feared the worst. As we got the line in I grabbed the leader and our fears were realized as the hook was bare. We gathered ourselves and ran it back out with another whiting and waited some more. At 4:00 PM the 9/0 slow rolled and then took off without any end of the run in sight! I harnessed up and shark on! This shark put up a very little fight until it got in to the second bar. That is where it made some good runs and good head shakes just before the leader surfaced. As the leader came out of the water, the dorsal fin showed itself and in no time the shark was beached. 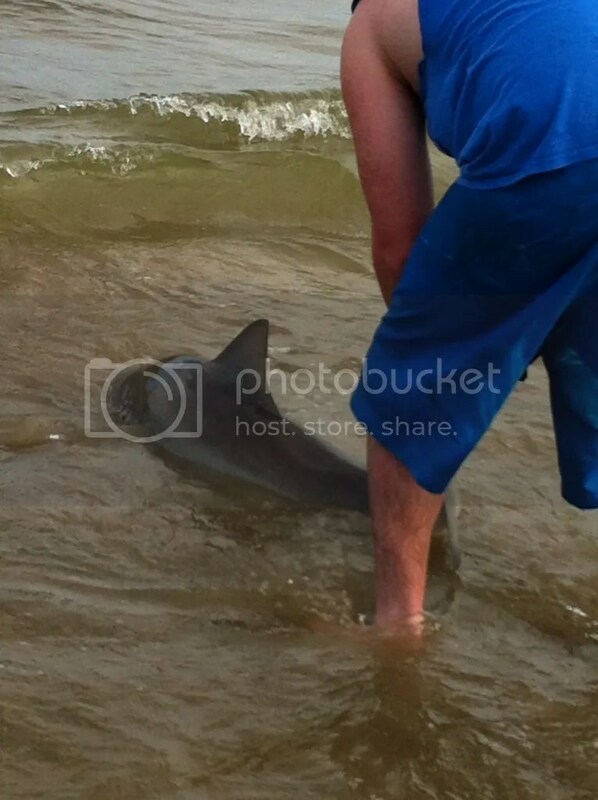 Another great bull shark, which taped out at 60 inches, was successfully landed and then released. Justin, Craig, and Josh pose with Josh’s second bull of the trip! Josh walking a bull into water deep enough to for it to swim off strong. We got the 9/0 rigged back with ray and dropped it the farthest all trip at around 500 yds. It’s now 5:30 and Craig and I are headed to the surf for more bait when the 4/0 takes off. Craig harnesses up and shark on again. 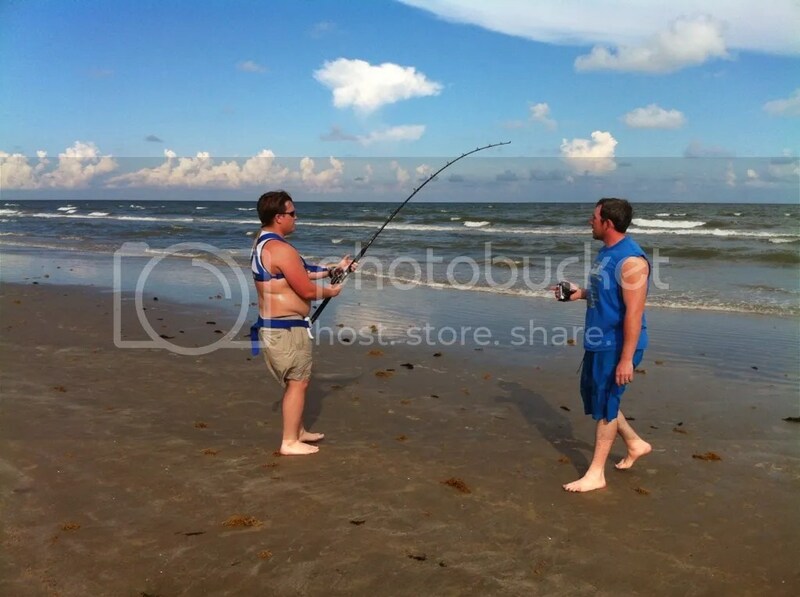 Craig fought the shark for roughly 20 minutes with little fight once again. Once the shark hit the second bar it showed it’s dorsal and tail. 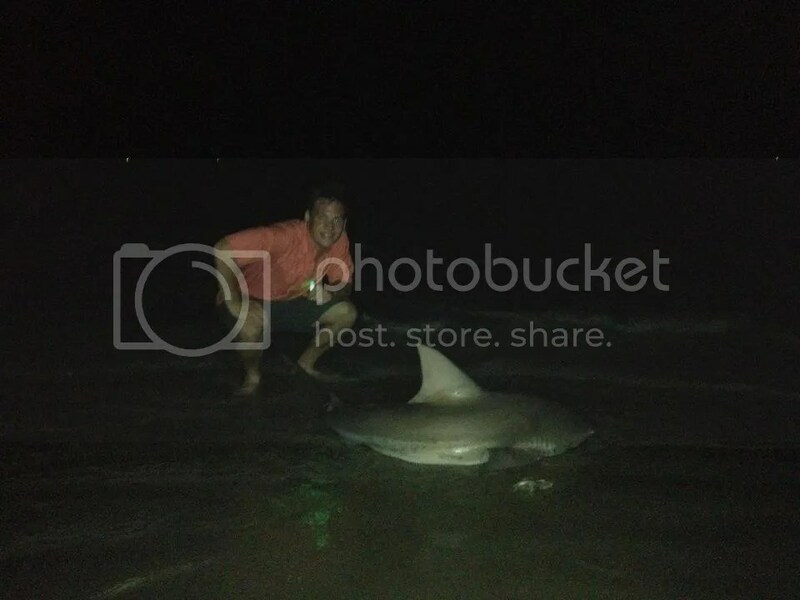 I grabbed the leader and pulled another great Bull shark to the sand. This one taped out at 64 inches and a new personal best for Craig. We revived her and sent her on her way. We ran the 4/0 out with another ray and changed the bait on the Okuma from whiting to a ladyfish that Justin caught earlier in the day. Finally, it was time to relax and build a fire for some light as the night was growing nearer. Josh, Craig, and Justin pose in front of the rods as glow sticks hang. We waited as long as we could but the only action we got before calling it a night was the Okuma getting weeded out. This was our queue to leave. With a successful trip and a 5 out of 7 hook up ratio, we were pretty excited about what the trip had produced. This was definitely a great trip filled with great memories and some even better, personal bests! Nice write up, man… sounds like y’all had a blast! How did you get that last Bull out? What rod do you have on that 9/0?? ?